This Oct. 22, 2015, file photo shows the Universal Park globe in Orlando, Florida. Should a theme park post warning signs about a ride's potential dangers in a language other than English? The family's 38-year-old father suffered a fatal heart attack two years ago after going on the "Skull Island: Reign of Kong" ride. 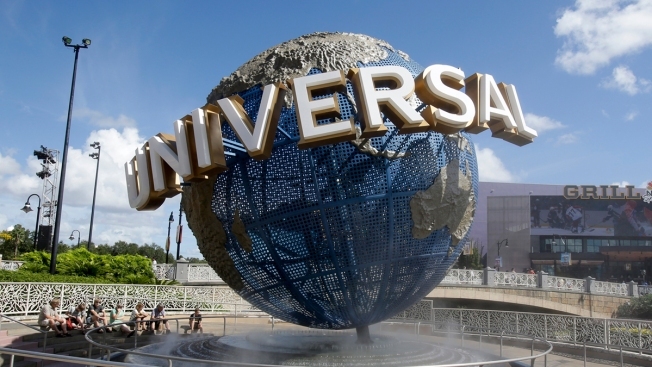 Jose Calderon Arana, who had prior heart problems, didn't speak English and his family said in a wrongful death lawsuit filed this month that Universal was negligent by not displaying warning signs in Spanish. Universal spokesman Tom Schroder said in an email that the theme park resort doesn't comment on pending litigation. The official blog of Universal Orlando Resort has Spanish and Portuguese translations. The family's personal injury attorney, Lou Pendas, said it's not unreasonable to have ride warning signs in English, Spanish and French so visitors can make informed decisions about whether they should go on the ride. Orlando was the most visited U.S. destination in 2017. Although it's difficult to gauge what percentage of visitors to central Florida's theme parks don't speak English, local tourism figures show that 6.1 million of metro Orlando's 72 million visitors in 2017 came from outside the United States. A little less than 900,000 visitors came from three Spanish-speaking countries in Latin America — Mexico, Argentina and Colombia — and more than 820,000 tourists came from Portuguese-speaking Brazil. "This isn't a crazy request or expectation. It's actually quite basic in this day and age," Pendas said. "You are asking for international travelers. This is a mecca for tourism. This is a very basic thing that should be thought of for the safety of patrons." Skull Island had been open about half a year at the time of Calderon Arana's death in 2016. Using animatronics and 3D screens, the ride recreates a truck expedition through the carnivorous-creature-filled island inspired by recent iterations of the King Kong movies. A sign at the entrance of the ride says in English, "Warning! This ride is an expedition through the rough terrain of King Kong's natural habitat. The movement of the truck is dynamic with sudden accelerations, dramatic tilting and jarring actions." It warns that people with heart conditions or abnormal blood pressure, back or neck conditions, and expectant mothers shouldn't go on the ride. Besides the English text, each of the situations has an accompanying drawing. Calderon Arana, who ran a major farming operation owned by his family, didn't feel well after going on the Skull Island ride — his wife thought he had an upset stomach, according to the lawsuit. Officials with Disney World didn't respond to an email asking about their warning signs. SeaWorld officials say their signs include disclaimers in Spanish and Portuguese asking visitors to ask questions if they need help. "A lot of times it's based on the location of the park, diversity of the people who come. For example, at Kings Island in Cincinnati, you certainly wouldn't have Chinese signs," said Speigel, president of International Theme Park Services Inc. "Unfortunately, as litigious as our society is, when something happens in a park, whether you stub a toe or have a heart attack, people want to sue you." Universal Orlando Resort is owned by NBCUniversal, the same company that owns and operates this website.